Memphis City Hall is located at 125 North Main Street, Memphis, TN 38103; phone: 901-576-6000. Photo: Hunt-Phelan House, ca. 1838, 533 Beale Street in Memphis, TN. Listed on the National Register of Historic Places in 1971. Photographed by User:Thomas R Machnitzki (own work), 2010, [cc-by-3.0 (creativecommons.org/licenses/by/3.0)], via Wikimedia Commons, accessed January, 2014. 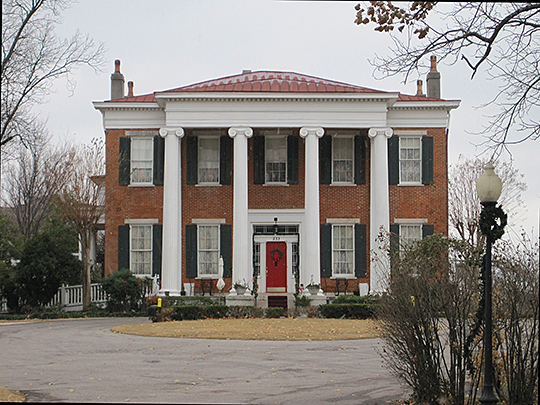 Memphis, the county seat of Shelby County, is located on a high bluff overlooking the great Mississippi. It is from a fancied similarity in location that Andrew Jackson gave to it the name of its ancient Egyptian prototype on the river Nile. The city was incorporated in 1826, although at the time its population was barely 300 inhabitants. From 1826 to 1906, in spite of several reverses, the city has developed into the acknowledged metropolis of Tennessee with a population of over 150,000. Here is the first inland cotton market in the world. In the surrounding agricultural district is produced over 1/10th of the entire cotton production of the world, almost 1/8th of the annual crop in the United States. Memphis also stands first as the largest hard wood lumber market in the world and ranks as the 6th city in the list of grocery markets in the United States. As a financial center the city stands preeminent in the South. The total of bank clearings of Memphis exceed the combined totals of Atlanta, Nashville, Chattanooga and Birmingham. Memphis is a city of beautiful homes. Miles of electric car lines supply rapid transit to the citizens. The streets are well-kept and the public buildings and business blocks exhibit a grade of architecture decidedly above the average. Two modern theaters and a grand opera house contribute to supply the citizens with all that is best in the dramatic arts. The great river supplies a cheap method of transportation and 10 lines of railroads put Memphis in close connection with all the great trade centers. The city has an established reputation as the gateway to many famous pleasure resorts, especially Raleigh Springs, noted for its medicinal waters and splendid hotels. The American horse racing season begins in Memphis every spring and fall. Here is located the fastest racing track in the world, and the large purses invariably attract the attendance of the best horses of the American turf, and their noted owners, trainers and jockeys. Memphis: The Metropolis of Tennessee, S. H. Kress&Company, publisher, Memphis, 1907.